After four years as a band, Oasis off-shoot Beady Eye are calling it quits. Taking to Twitter, Liam Gallagher confirmed the news early on Saturday, saying, "Beady Eye are no longer. Thanks for your support. LGx." 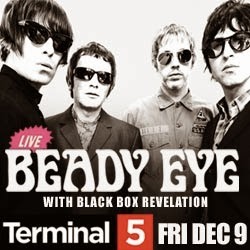 Guitarist Andy Bell also tweeted about the news and said, "Thanks to all the Beady Eye fans. See you on the other side. Big Love. Andy B X." The band, who released two albums, 2010's Different Gear, Still Speeding and 2013's BE, featured all of the former members of Oasis sans Noel Gallagher. While no official word as to what caused the split, the news has caught fans around the world off guard.